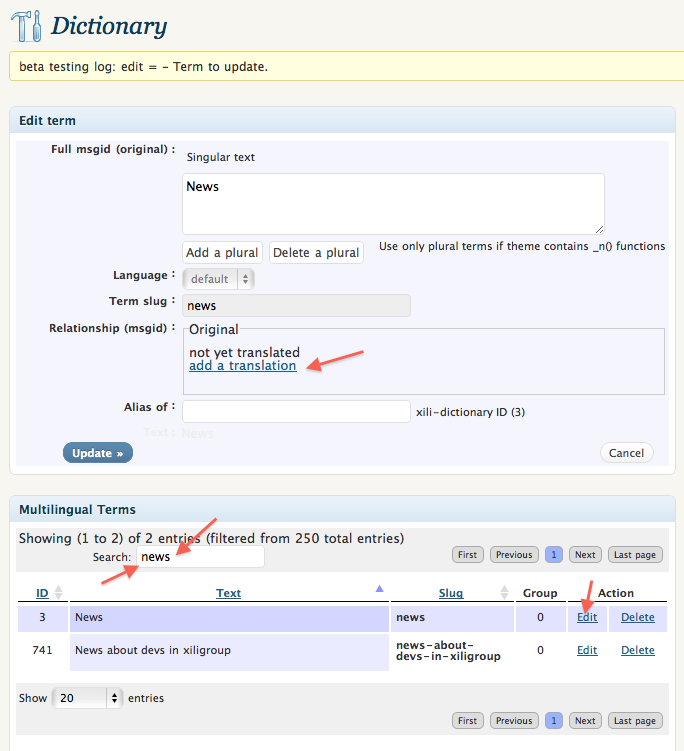 In previous episode, we learn how to add translations for categories and in the result, the categories list in sidebar will have the same language as the current language of the shown post. 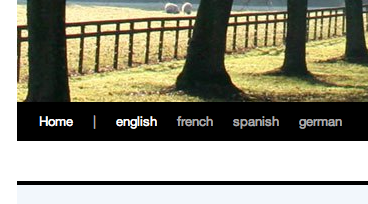 By clicking one of the categories, the website remains in the same language. Now, step to built the menu and his language navigation. The demo “Child theme” contains special css style to transform name of language directly in country flag. For better understanding, the part of that style is temporary disabled below in snapshot. 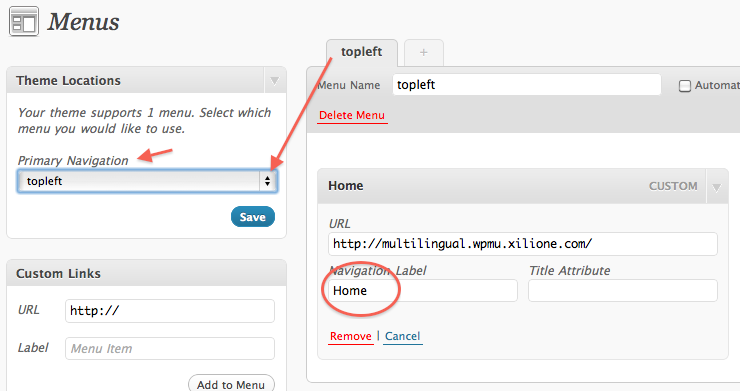 Here above a very simple example with home menu line in topleft menu affected to primary navigation location (arrows) – don’t forget to save menu and location (blue buttons). Now, the languages series will be AUTOMATICALLY added to the end of menu at left. 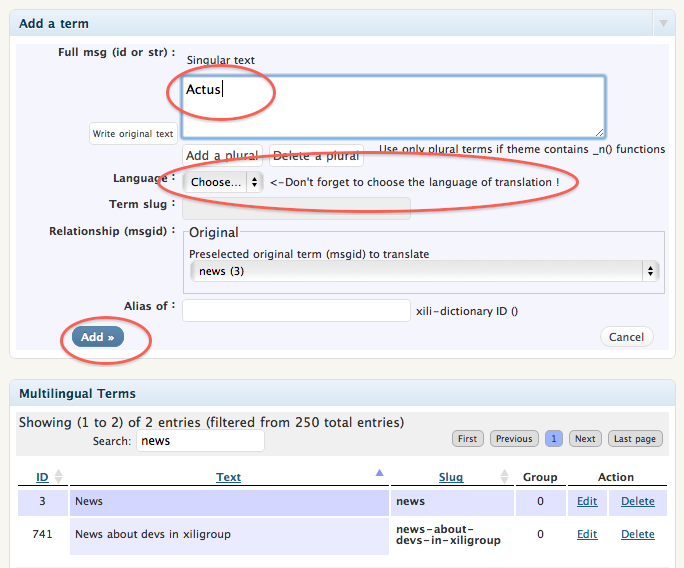 Each term of menu item (and translations) must be in .mo files and can be added with xili-dictionary plugin. 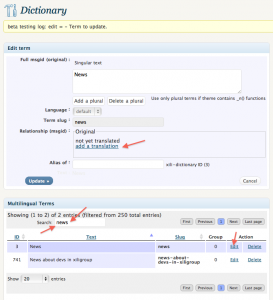 Note: this above example includes automatic adding (and selecting) a series or sub-series of pages. 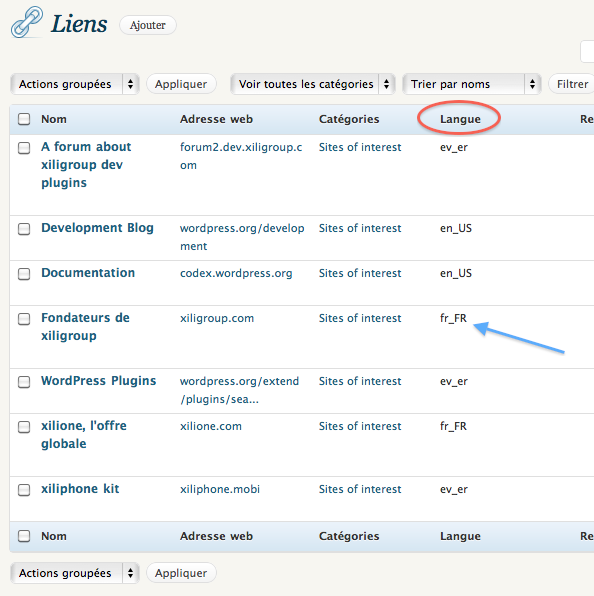 In dev.xiligroup.com, a special navigation location was created on top-right for flags and language home switching ! In the previous post, some important steps were defined. This post follows also the series about child theme. For xili-language 2.1.x, You must use updated twentyten-xili-v1.1 of twentyten-xili. Can be found in sub-folder languages of theme’s folder named twentyten of each kit as below. COPY the .mo and .po files for each languages in sub-folfer ‘langs’ of CHILD theme twentyten-xili (the original will not be modified). 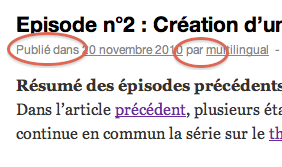 Creating a category – such as “Actualités” then “News” and its description (“Recent news about website) BECAUSE the pivot language is English. Writing of one or two articles in French and / or English – we will learn to link if their content is the translation – adaptation of the other. Steps 1 to 6 are easy, but we will spend time at step 4 and 6. 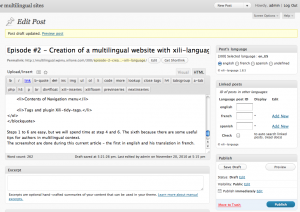 The sixth because there are some useful tips for authors in multilingual context. 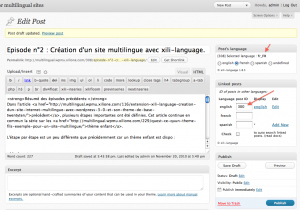 The screenshot are done during this current article – the first in english and his translation in french. Because, I currently write the both version, I will open a new tab in the browser by clicking Add New at french line in Linked posts box at left (I use right button of the mouse and select ‘Open link in new tab’) . 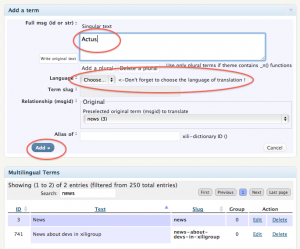 After full editing and saving, when post displayed as single the terms around this are translated according language of the displayed post. In child theme the file functions.php is an important file. 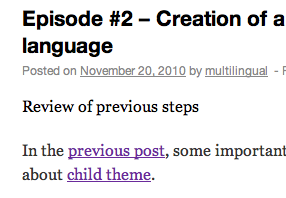 Contrary to other files, it don’t “cancel” the functions available in functions.php of parent theme. Be aware of that ! The first function ‘twentyxilidev_setup’ call by the action after_setup_theme is important. Inside, a nav menu area is added. By re-loading text domain, the files .mo inside subfolder of child are used. This add_action must called after the others: so order is set to 11 or more. In extract of ‘special_head’, a filter incorporate a new radio-button series under the search input. 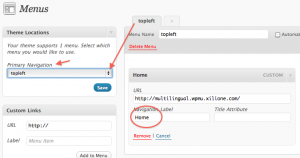 In this file, it is also possible to cancel widget spaces or menus space if necessary. On this website, in footer bottom left, the links list is changing according current displayed language : how to set the widget and xili-language ? 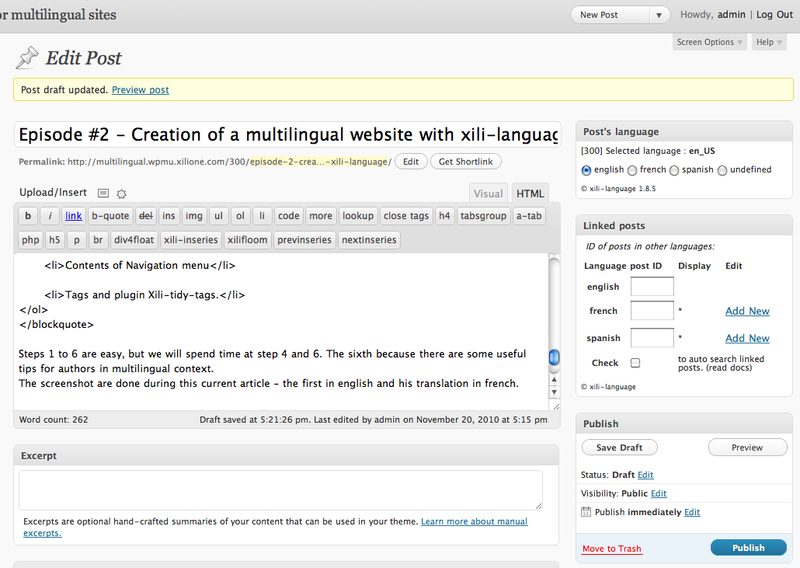 Without php coding, it is possible to do that since version 1.8.5 of xili-language. This version manages a language taxonomy for links (link_language). Link is an object as post so it is possible to create a taxonomy accordingly the language taxonomy (language) of posts. 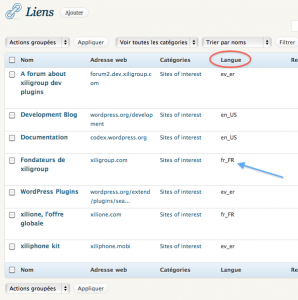 The cost is more than 100 php lines added inside the plugin to manage the UI, hooks and filters ! 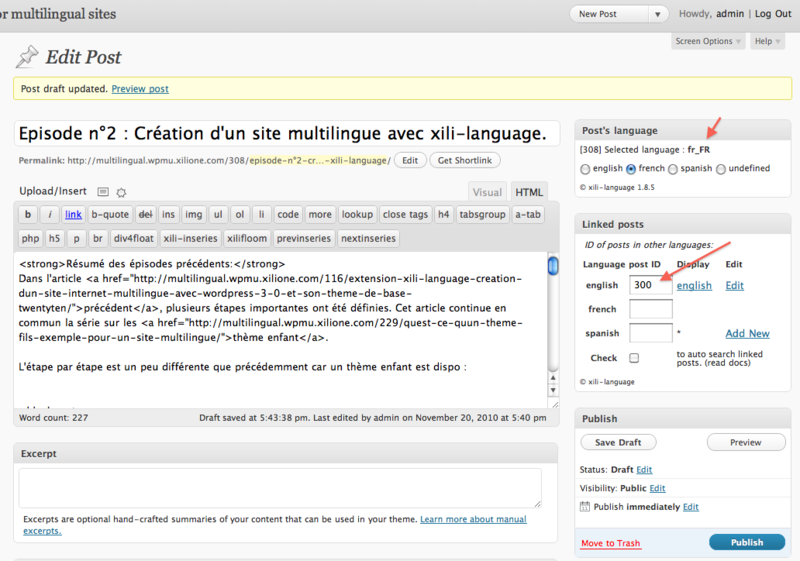 As for the articles, the link edit screen contains a box where you can check the language. There is a pseudo-language ( Ever ) that exists and, assigned to a link, this link is displayed everytime. xili-language has in Settings screen also has (if the theme is widget compatible) a box where you can choose categories of links that will have sub-selection by language.